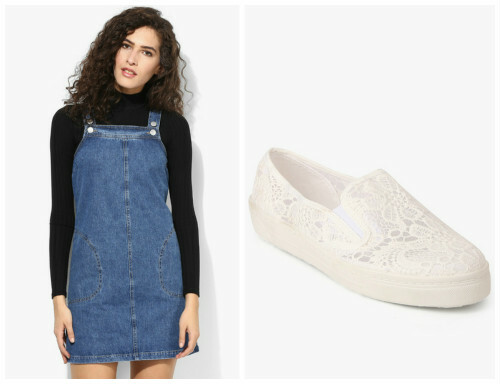 8 Amazing Outfits That Are *Perfect* For College! This pretty embossed sleeveless white top matches well with these soft dark blue jeggings. The comfort-fit top and light bottoms will help you stay cool throughout the day. Complete the look with a pair of black ballet flats. Jumpsuits are ultra comfy and can be worn anytime, anywhere! 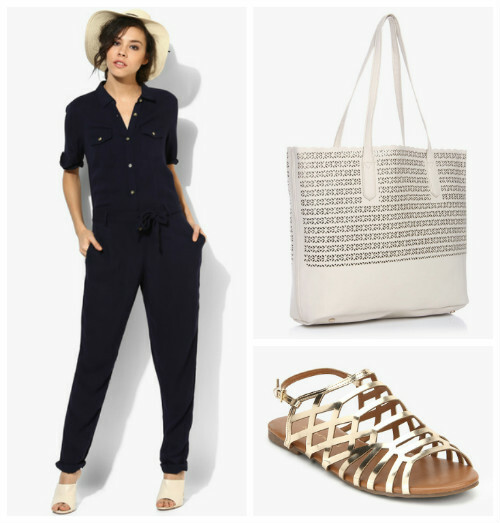 Match this chic navy blue jumpsuit with some gorgeous metallic sandals for a comfy yet stylish day at college. Complement the look with a tote bag of a neutral colour to accommodate all your books. Floral prints never go out of style! 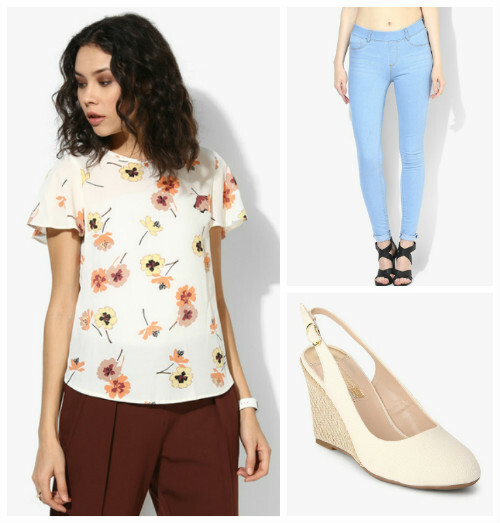 Match this pretty floral top with these ice blue skinny jeans and off-white wedge heels. Wedge heels add height without being uncomfortable and the floral top plus jeans look is a classic. How cute is this denim pinafore dress from Dorothy Perkins! You can wear it with a long-sleeve tee under it like this one or even a sleeveless bodysuit. Match it white shoes like these pretty slip ons and you’ll be ready to walk from class to class at college. Athleisure is totally in nowadays and we love it. Style these comfy joggers with your favourite crop tops. Add on this gorgeous printed kimono and top off the look with these pretty strappy sandals for a stylish yet comfy outfit. Complete your look with this oversized tote bag and you’re ready for a thrift shopping spree post college. Another floral print top on our list is this off-shoulder beauty. Match it with this bright orange skirt and beige belly shoes for a complete look. This look is so cute it not only makes you stand out in college, it also makes you the centre of attention on a date. Black and white is a classic combo which all of us absolutely love! Match this black bodysuit with this super cute white applique skirt. Complete the look with a comfy pair of plimsolls if you have a whole day classes to attend or wear pretty heels like these if there is an event in college and you have to wear them only for a few hours. Shorts are always fun to wear and this pair of white embellished shorts are no different. Match it with your favourite crop top and this pretty throw on with fringes. Complete the look with simple black sandals and head out to the next music festival! The amazing outfits we’ve shown here are all from the Dorothy Perkins Collection at Jabong. You can shop for them as well as many more international brands on their site. What are you waiting for? :) *This is a sponsored post for Jabong.